While my next planned baking adventure is making the best bacon-chocolate cupcakes possible using your suggestions, first I carried on my new found love for homemade marshmallow and made a total classic: Rice Krispies Treats. A little butter + marshmallow + cereal = a gooey, sweet, fun dessert bar. They’re simple and easy to make. Adding the homemade marshmallow makes it a little more complicated, but still totally doable since the rest of the recipe is so simple. I also realized that they make a great treat for Passover when you get sick of chocolate matzo (if you are Sephardic and eat rice). The homemade marshmallow made them more gooey and vanilla-y. I stayed with the classic recipe, but look forward to modifying it in the future. My favorite addition is M&Ms (frozen, so they don’t melt). What do you like in your Rice Krispies Treats? Lightly grease a 13″x9″ baking dish. In a small saucepan, combine 1/2 C cold water, corn syrup, sugar and pinch of salt. Whisk together over medium heat. Once sugar is dissolved, let sit unstirred until mixture reaches softball stage (around 235-240°F). While sugar mixture is boiling, sprinkle gelatin over remaining 1/2 C cold water in a large, deep heatproof bowl (a stand mixer bowl is perfect for this). Let stand for about 1 minute, until it softens. Beat this at medium speed. Once sugar mixture reaches softball stage, remove from heat and carefully pour into gelatin, avoiding the beaters and sides of the bowl. Immediately begin mixing on high speed, for 5-8 minutes, until mixture increases in volume and turns white and thick. Add vanilla and beat for a minute more. While the marshmallow mixture is being mixed, melt butter in a medium saucepan. Add marshmallow to melted butter and mix together. 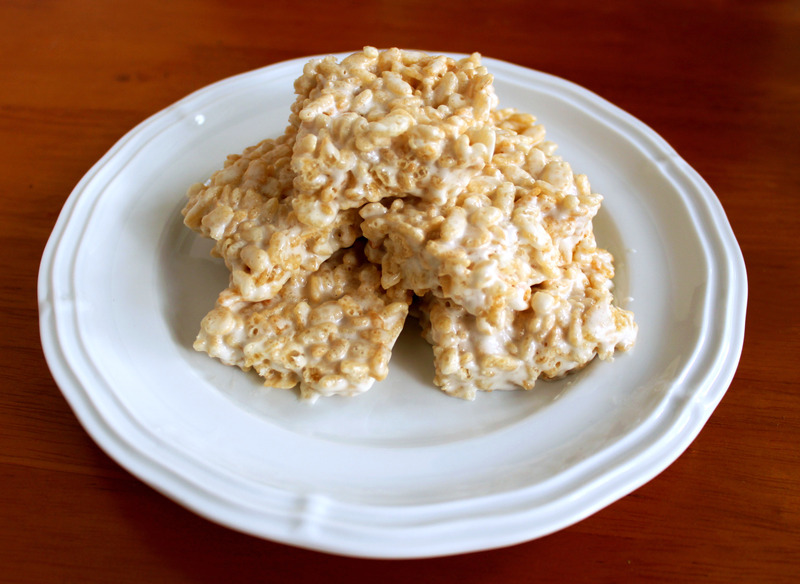 Remove from heat and stir in Rice Krispies, one cup at a time, mixing thoroughly to ensure all pieces are coated. Press evenly into a greased 9 1/2″ x 13″ casserole dish and allow to cool for 1-2 hours. I love adding some peanut butter and melted chocolate! Sometimes separately, sometimes both at the same time! I’ve been wanting to make my own marshmallows for some time now, so seeing this recipe is making me want to do it sooner rather than later! Peanut butter and chocolate – yum! I’ve never tried that but it sounds like a great idea. No, I wish! It’s a basic marshmallow recipe, which almost always have gelatin in them. It’s a lot better (IMO) than store-bought marshmallow – gooey, fluffy and smooth. I have read that using homemade marshmallows has a tendency to make the rice crispies take on a stale-like, less crispy texture. Did you notice any difference in the texture when you made them? 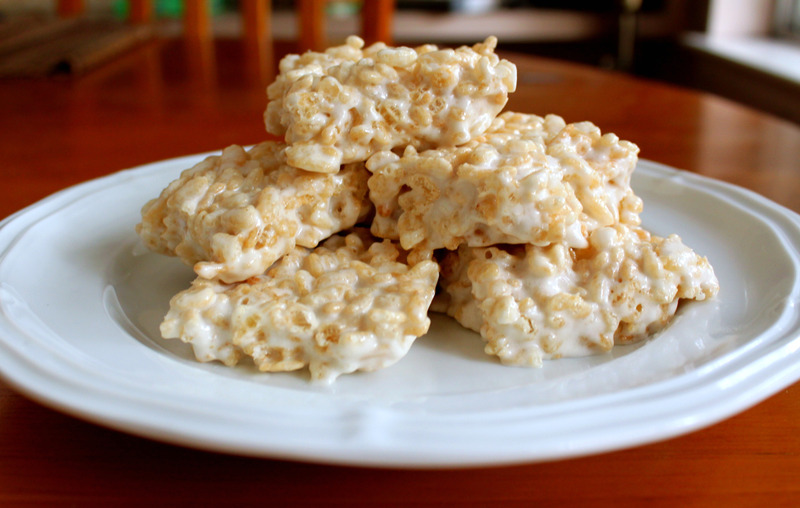 Hmm, I do remember them seeming a little stale, but I was using really old Rice Krispies so I chalked it up to that. I will have to try making them again soon and test out this theory. I’m very exited to try this recipe! I love that I won’t have to make the marshmallows first and let them sit overnight! I do have a questions though. I don’t see the amount of rice krispies needed in the ingredient list. Can you please tell me how many cups of rice krispies to use? I am making these and wonder if they can be frozen for future use? My hubby’s a teacher and I would love to make these for him to take to work each day – but on the side of the cereal box it says they should be eaten within a day. Thoughts? @Darlene – I’ve never tried freezing them myself. I think if you store them in an air-tight container they should keep for 1-2 weeks. If you don’t want to waste an entire batch, I would try freezing one or two bars and see what happens. Let me know how it goes – I’m really curious now! I’d love to try this but unfortunately I don’t fancy making a mess in the kitchen! I’ll try it someday though, don’t you worry! When you add the marshmallow to the butter, do you melt the marshmallow so that all the air is gone or do you just combine the butter and marshmallow. When I made them the other day, I let the marshmallows set and then melted them. I like skipping the step of letting them set, but was curious what would happen if you tried to make the treats with marshmallow goo that still had all the air in it. I made these and they did make the rice crispies taste stale. Which is unfortunate because the flavor of the homemade marshmallows was AWESOME… Any suggestions?! Very, Very easy to do. No off taste like packaged marshmallows leave behind. I surprised even me that these would turn out well given my inexperience with making “candy” things. Getting the temp right was easy. Follows the instructions without deviations. Teaspoon or trablespoons? You just put T. Thanks! Anyone know how to combat the ‘stale Krispies’ with HM marshmallows? I tried a chocolate marshmallow recipe, added melted butter the last minute of mixing the marshmallows, and added a box of Rice Krispies. The next morning, the krispies tasted soggy, as I’ve read in other posts online. Any suggestions to keep the Krispies crispy? Thanks for any suggestions…. Did you ever find a solution? I’m looking for the answer as well!